Keep up with our latest EU campaign news and commentary by following us on Twitter. ​head-to-head with the European Movement in a local in/out campaign. 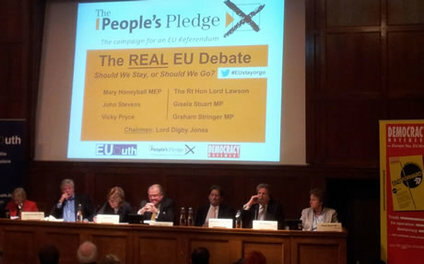 Stuart MP (Labour) speak for the DM during a People's Pledge EU debate. The Democracy Movement was founded in 1998 through a merger of the Referendum Movement - the non-party, grassroots 'Keep the Pound' campaign which came out of the Referendum Party's 1997 general election campaign - and the Euro Information Campaign established by the Yorkshire businessman Paul Sykes. Through creative grassroots campaigning and network-building combined with high profile advertising, in the space of a few years the Movement grew very quickly from 5,000 to 325,000 registered supporters, becoming Britain's biggest organisation campaigning on EU issues. Successes include playing a leading grassroots role in the campaign to keep the UK out of the euro (1998-2002) and securing a pledge from Tony Blair of a referendum on the original EU Constitution (2002-2005). The DM also campaigned for that referendum to be delivered with respect to its successor - the Lisbon Treaty (2005-2008), which came down to a close vote in Parliament. 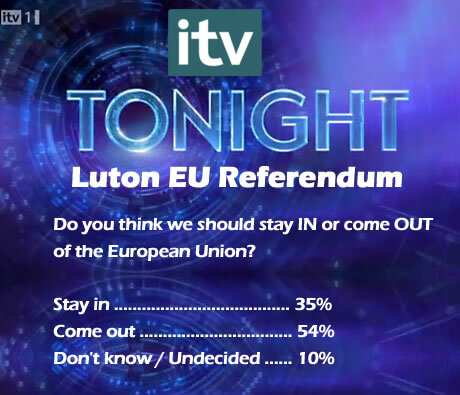 In the course of this campaign, the DM was selected by the ITV Tonight programme to run the highly successful 'Out' campaign in a mini EU referendum held in Luton - a result seen by 3 million ITV viewers. The 54% vote to leave the European Union remains the among highest polling figures for exit - and this wasn't just a poll, but an actual vote. The DM has also campaigned against the scale of Britain's contribution to the EU budget, through the then novel approach of breaking the figure down into daily and weekly amounts and comparing those to the financial needs of public services such as the NHS. Former Prime Minister David Cameron claimed subsequently to have secured, for the first time, a real terms cut to the UK's payments into the EU budget. In 2011, the DM was instrumental in establishing - and strongly supported - the independent People's Pledge campaign for an in-out EU referendum, which is credited with a major role - if not the definitive role - in securing the EU referendum. This independent, multi-faceted campaign, based on a unique concept of a constituency-by-constituency 'people's pledge', deployed a number of ground-breaking techniques - from a novel website recording MPs' stances, votes and video pledges, to conducting dramatic, constituency-wide referendums in marginal seats. It was described by Conservative MEP Daniel Hannan as "arguably the most successful pressure group in recent history". ​The EU referendum on 23 June 2016 was the culmination of the Democracy Movement's campaigns since 1998 and we were one of the leading groups working independently for a Leave vote during the referendum. In addition, both our long-term slogan - Europe Yes, EU No - and the basis of our popular Stop the Cheques campaign, which contrasted the scale of funds paid daily to the EU with the financial needs of public services like the NHS - were adopted by the official EU referendum Leave campaign, Vote Leave. The Democracy Movement is a large, non-party network of registered supporters and activists, backed by a small leadership team headed by its director Stuart Coster. We are a multi-faceted campaign, working with our allies in parliament, conducting and publishing research, promoting our case in the media, and campaigning at the grass-roots to win support for our ideas and direct pressure for change onto political decision-makers. The Democracy Movement works with those who share our beliefs, of all political parties and of none, without endorsing parties or individuals at elections, and alongside other groups similarly committed to challenging the EU's powers over its member countries. We will also continue to work with our allies in other European countries fighting similar debates. It's free to support our campaigns and to get involved. However, our activities are funded only by voluntary donations from individual supporters. So if you like our work please consider helping us with a donation so that we can continue. Stuart joined the Democracy Movement's team in 1998, out of university, to get involved in the looming battle against euro membership in the promised referendum that was secured by the DM's predecessor, the Referendum Party. Initially responsible for setting up local branches in the South East and East of England, he was closely involved as the DM grew rapidly to over 320,000 supporters and 160 local groups at the peak of its 'keep the pound' campaign. Since then he has played a key role in all the DM's campaigns, events and grassroots activities, including originating its Stop the Cheques campaign on the EU budget that was later adopted by the official EU referendum Leave campaign Vote Leave, devising a novel ReferendumList website monitoring and publicising MPs' views on a Lisbon Treaty referendum and organising the successful DM 'out' campaign during the ITV Tonight Luton EU Referendum that saw 54% of people vote to leave the European Union. In 2011, with two colleagues Marc Glendening and Chris Bruni-Lowe, Stuart co-founded the People's Pledge campaign for an in-out EU referendum and joined the campaign team as operations director, becoming director in 2013 until the successful conclusion of the campaign on 23 June 2016. The Democracy Movement (DM) is an independent pressure group campaigning to defend liberal democracy in Britain and across Europe. We believe that this is fundamentally undermined by the euro (economic and monetary union) and the wider EU drive to create a Brussels-based system of government, which will result in all major decisions being taken at the European Union centre by undemocratic institutions. Our vision instead is that of a Europe of democracies in which elected governments can co-operate together on issues transcending national boundaries where there is voluntary, common agreement. This objective will obviously entail radical changes either to the current structure of the EU or to the relationship between Britain - perhaps together with other member states - and Brussels. Removing the EU's legal superiority over its member countries and making Europe's elected national parliaments legally supreme once again is a necessary first, if not sufficient, step towards a democratic re-Enlightenment in our continent. This is why we campaigned for - and supported in the EU referendum - the UK to replace its EU membership with a positive new deal with the EU based on trade and co-operation - not outdated political centralisation. Because of our commitment to diversity, democracy, and decentralisation in our continent, we consider ourselves to be the true pro-Europeans in this debate. We believe that those who are trying to construct a pan-European government are working against the interests of all ordinary European people. The more decision-making is centralised in Brussels, the less voting power ordinary European citizens possess. The key contradiction of the EU project is that it seeks to concentrate ever more law-making power in Brussels when single policies simply cannot suit the different, local needs and aspirations of Europe's diverse countries and peoples. Europe has never naturally been a single political entity and the various attempts to impose an artificial unity have ended in disaster: the empires of Charlemagne, Napoleon and Hitler being examples. Europe's great cultural and economic advances - the Renaissance, the Enlightenment, the Industrial Revolution - took place when and because our continent was a collection of diverse, competing entities free from the suffocation of a single dominant ideology and corrupt centre of power. We also envisage the peoples of Britain and Europe having an outward-looking attitude to those countries and continents that lie beyond the boundaries of the EU. We are internationalists and reject emphatically not only the 'little Englander' but also the 'little European' mindset that currently predominates in Brussels and among the EU's supporters. In the age of e-commerce and ever faster and cheaper transport it seems bizarre that there is an obsessive, out-of-date push to create an inherently rigid and cumbersome Europe-wide state. Our long-term vision is of a Europe of democracies that trade together, enjoy cultural exchange with each other, and co-operate voluntarily where it makes sense to do so. This is what the British people were told they were signing up to by the government when they voted to stay in the European Economic Community in 1975. Our view is that the current EU structure is a product of out-dated, top-down, technocratic thinking from the first half of the 20th century. The need now is for a lighter, more flexible structure that combines the roles of the (non-EU) Council of Europe and the European Free Trade Area. In the quickly-changing era of globalisation, the emphasis must be on the ability of countries to adapt with speed to changing circumstances, not creating enormous, slow-moving political structures. The Democracy Movement is a registered company limited by guarantee - a special non-profit status - registration no. 3673846. In accordance with legal requirements we file annual accounts and the details of our directors every year and these are available from Companies House to anyone who wishes to view them.